Elizabeth H. Gauger and Kenneth M. Goins, M.D. Chief Complaint: "Worsening vision in right eye"
History of Present Illness: 63-year-old female with known history of Fuchs endothelial dystrophy and bilateral pseudophakic bullous keratopathy presents to clinic for decreasing vision in the right eye. The patient recently suffered a traumatic accident to her left eye, and is essentially monocular as a result. 3/2007: Open globe, rupture of previous penetrating keratoplasty, and suprachoroidal hemorrhage OS after a traumatic fall. This patient has a complicated ocular history. She was diagnosed with Fuchs endothelial dystrophy in 1997, for which she underwent penetrating keratoplasty (PKP) of the left eye (OS) due to worsening visual acuity. In 2000, she had bilateral cataract extraction and intraocular lens placement. The combination of endothelial damage due to Fuchs dystrophy and intraocular lens placement led to bilateral bullous keratopathy, causing a further decrease in visual acuity. The plan was to proceed with PKP OD, however in March 2007, several months before the scheduled operation, the patient fell on uneven concrete while walking her dog. She suffered an open globe and dehiscence of existing PKP (OS). The open globe was repaired, however she was found to have a large suprachoroidal hemorrhage, and prognosis was poor. Patient's visual acuity remained no light perception (NLP) OS post-repair and hand motions at 1 foot OD. Social History: Tobacco use (10 pack years, quit 5 years prior), denies alcohol use. OS: Full-thickness corneal graft, 1+ conjunctival injection. 3+ corneal graft edema. Anterior chamber formed. Blood over iris and pupil. Lens unable to be visualized. (Figure 1B). Dilated Fundus Examination: OD: Normal. OS: No view. Figure 1A (image on left):Fluorescein staining, right eye. Note the presence of epithelial bullae, which appear as dark spots on direct illumination. Figure 1B (image on right): Left eye. Diffuse corneal edema and fibrin obscuring pupil and iris seen. 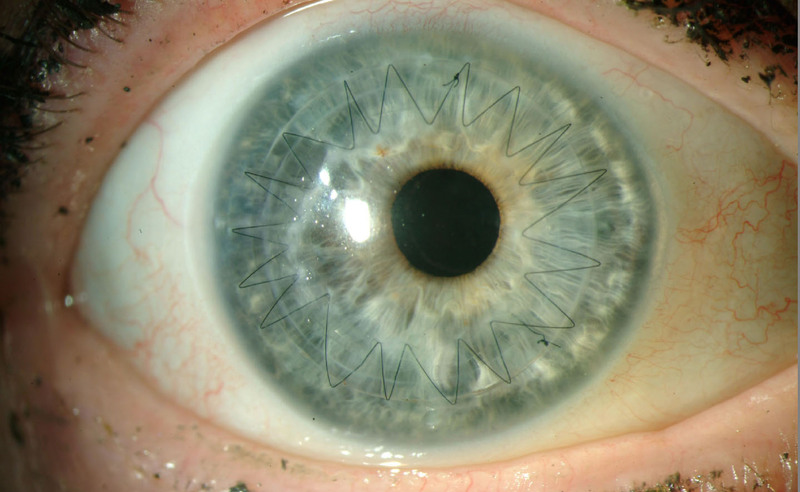 Note the presence of existing corneal graft from ten years prior (1997). At the time of the fall in March 2007, the patient suffered an open globe and dehiscence of corneal graft, repaired with the sutures seen nasally. Globe and graft were repaired, however vision could not be salvaged because of suprachoroidal hemorrhage. This patient, unfortunately, has several ocular pathologies contributing to her decreased vision: a ten year history of Fuchs endothelial dystrophy, pseudophakic bullous keratopathy, and an open globe with rupture of a previous corneal graft in the left eye. The combined effect has resulted in an essentially monocular patient (NLP OS post traumatic accident) with decreased vision in the remaining eye (OD). Fuchs endothelial dystrophy is an inherited degenerative disease of the endothelial cells of the cornea. These endothelial cells are the innermost layer of the cornea and are responsible for maintaining fluid balance of the corneal stroma in order to maintain corneal clarity and thus optimal refractive ability. The most common form of the disease, late-onset Fuchs, has been mapped to chromosome 13. The inheritance pattern is likely autosomal dominant. Penetrance is quite variable within families. As such, there is often no known family history because affected family members may have had mild or undiagnosed disease. The disease is 2.5 more times prevalent in women than men and occurs in 4% of the population greater than 40 years of age. Complications of disease generally does not manifest before the fifth decade of life. The initial symptoms of disease are decreased/blurry vision upon awakening, which generally improves throughout the day. This occurs because, overnight while the eyelids are closed, the tear film does not readily evaporate, becoming hypotonic. The hypotonicity of the tear film, in conjunction with decreased evaporation, leads to stromal edema, causing refractive error in the patient. Since the corneal endothelium (unlike the corneal epithelium) is thought not to regenerate new cells, the disease progressively worsens, eventually leading to the need for corneal transplant in order to restore functional vision. Prior to surgery, however, there are several medical therapies that can be tried. The mainstay of therapy is hypertonic saline eye drops (such as Muro 128). Other measures which have been reported include using a hairdryer to gently dry the eyes, soft contact lenses, and intraocular pressure-lowering agents. These treatments have limited long-term efficacy. The progression of the disease involves continued loss of endothelial cells, leading to stromal swelling, and eventual appearance of bullae on the corneal epithelium (bullous keratopathy) . If the disease progresses to the extent that it affects all layers of the cornea, a full-thickness corneal transplant may be necessary to restore functional vision. The standard surgical treatment of Fuchs dystrophy has been full-thickness penetrating keratoplasty (PKP), more commonly known as a "corneal transplant". The first recorded corneal transplant was performed in 1905 by Eduard Zirm in present-day Czech Republic. In 1920, and ophthalmologist by the name of Castroviejo experimented with various corneal donor shapes and identified a circular button' of tissue as the most promising. This method of cutting a circular button of donor corneal tissue and inserting it into the host cornea, in which a similar circular plug of corneal tissue had been removed, became the standard method of PKP for several decades. DLEK, DSEK, and DMEK are advantageous in diseases in which not all five layers of the cornea have been affected (i.e. no severe anterior corneal scarring or bullous keratopathy). Thus, for early treatment of Fuchs, in which the patient has loss of endothelial cells leading to decreased vision but has not yet developed epithelial bullae, DSEK, DLEK, and DMEK are promising procedures. 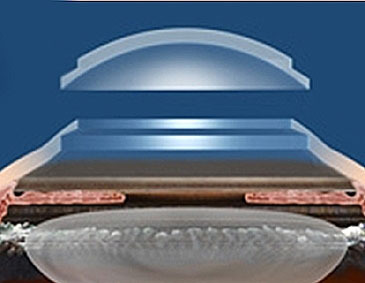 By transplanting only the dysfunctional layer of the cornea, the endothelium (along with Descemet's membrane and a variable amount of posterior stroma), the patient is less likely to experience infection (smaller wound), rejection (less tissue transplanted), and may have less astigmatism than if a standard full-thickness PKP had been performed. 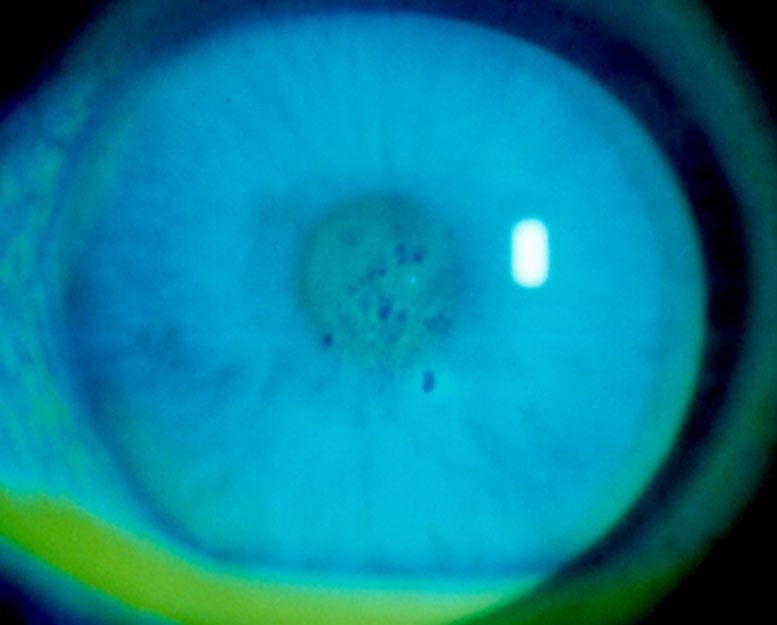 For patients in whom the disease has progressed to the appearance of chronic bullous keratopathy, full-thickness corneal transplant is indicated. Prior to 2003, this involved the standard corneal transplant described above: a circular button of donor cornea inserted into a circular hole of the same size in the recipient cornea. However traditional PKP, although it can restore clarity of vision, has several disadvantages. 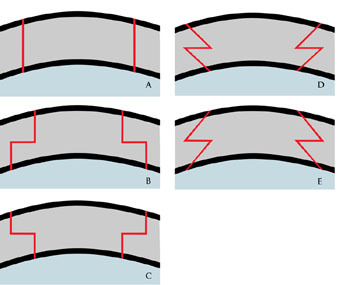 Due to the vertical interface and need for a perfect fit between the donor and recipient tissues, numerous sutures under tension must be placed in a radial pattern around the graft in order to approximate the tissues for healing, as well as to withstand the intraocular pressure. Because there are minute differences in tension on each of the sutures, patients often experience irregular astigmatism postoperatively. Visual rehabilitation for best corrected visual acuity can begin once there is adequate healing between host and donor tissues. However, this is time-consuming and it often takes from one to three years to reach best-corrected visual acuity. In 2003, Massimo Busin reintroduced the idea of a stepped graft edge as an alternative to standard PKP. He proposed that this would combine the enhanced visual optics of a full-thickness corneal graft with the increased wound stability of partial-thickness grafts (DSEK, DLEK, and DMEK). Additionally, his proposed graft shape of a "top hat", would allow a greater number of healthy endothelial cells to be transplanted. 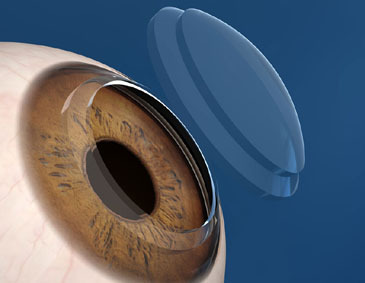 The technique involves cutting both the donor and recipient corneas into a shape other than the historically used circular "button" of tissue. A variety of shapes have been described, including the top hat, the mushroom, the zig-zag, and the Christmas tree (Figure 2). The technique first proposed by Busin utilized a top hat shape and was performed via a manual dissection. The initial results were promising: an immediately watertight seal able to withstand the force of IOP and decreased time to suture removal and thus visual rehabilitation. Although the technique has several proposed advantages over traditional PKP, including transplantation of a greater number of endothelial cells, the manual dissection is tedious, time-consuming, proposes risk to the donor tissue and can lead to small irregularities between donor and host corneas. Since 2005, an alternative to manual dissection exists. The use of the femtosecond laser (first approved in 2002 to create the corneal flap in LASIK procedures) was approved by the FDA for making full-thickness and partial-thickness cuts in 2005. The first paper detailing the use of the femtosecond laser to prepare human donor and host corneas for transplant was published in 2007. This increased application has now made it possible to make advanced shaped corneal cuts by laser, decreasing the need to do a technically difficult and time-consuming manual dissection. The femtosecond laser is an infrared laser that delivers very short pulses of energy (on the order of femtoseconds or 10-15 sec) in order to make cuts. With the use of software, the laser is pre-programmed to make cuts at specific depths, thereby creating the desired corneal shape. Here we concentrate on the top hat shape. 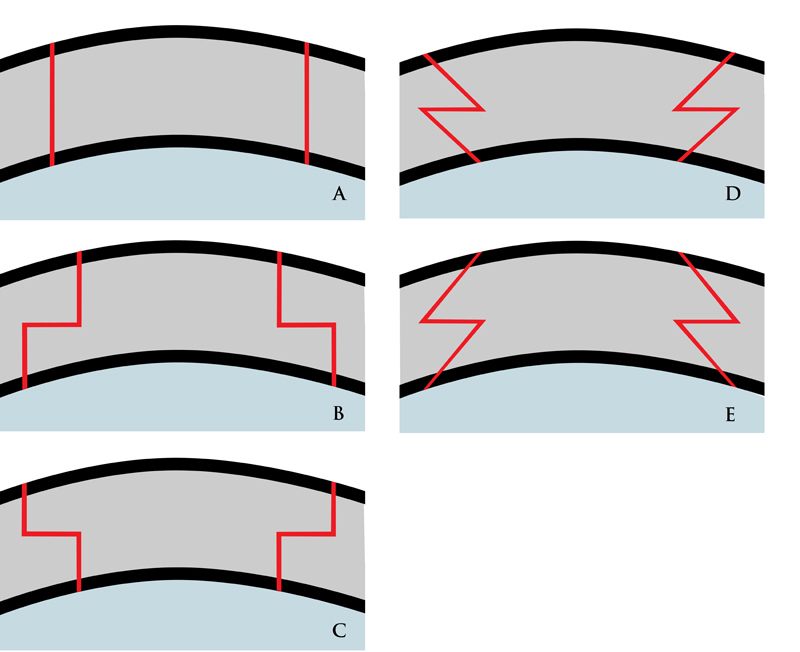 Although a variety of corneal shapes have been used in laser-assisted keratoplasty, several studies have shown the increased utility of the top hat configuration. In patients with Fuchs endothelial dystrophy, one would ideally like to transplant as many healthy endothelial cells as possible. The shape of the top hat (Figure 3), makes this possible. By creating a larger posterior diameter of tissue as compared with the anterior surface, a greater number of endothelial cells are transplanted. In addition, the top hat shape essentially acts as a one-way valve, maintaining a firm seal between the donor and recipient rims of tissue due to the back pressure of the anterior chamber (intracameral pressure). It is inevitable that there will be damage to endothelial cells during the transplant process. Any time the anterior chamber is entered or the cornea manipulated, there will likely be damage to and loss of endothelial cells. As such, every precaution is taken to ensure that tissue is handled as carefully as possible. 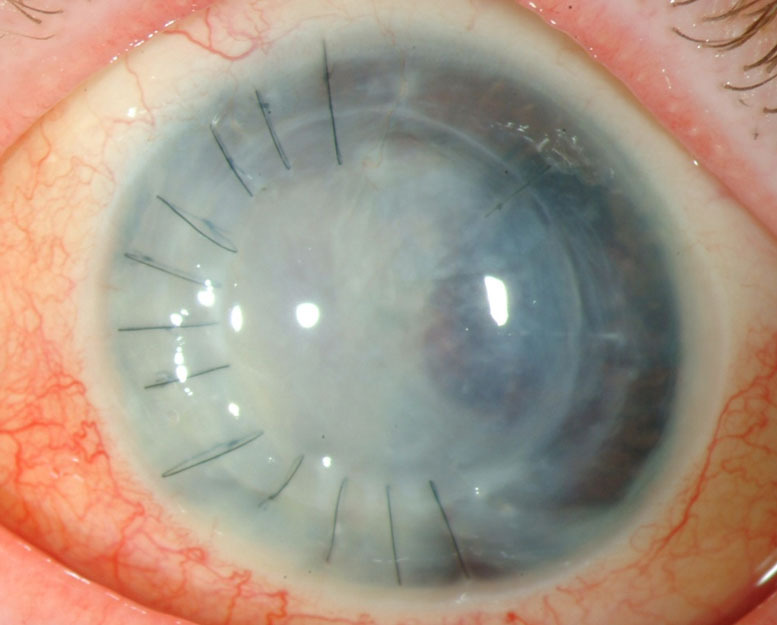 Figures 3A and 3B: Top hat shaped corneal graft. IntraLase software used. Images used with permission from Abbott Medical Optics. http://www.abbottmedicaloptics.com/products/refractive/ilasik/intralase-fs-laser. The decision to proceed with laser assisted keratoplasty over other more established methods of corneal transplant was multifactorial. This patient not only had full-thickness corneal pathology (Figure 4), but desired swift visual rehabilitation due to her essentially monocular visual status. Additionally, she had severe endothelial pathology, and thus greatest number of healthy endothelial cells was desired to be transplanted. 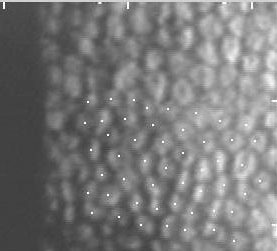 Preoperatively, corneal pachymetry was obtained and measured 779 microns (Figure 5). The decision was made to proceed with the top hat shaped graft as above. The parameters used in the IntraLase software are listed in Table 1. The donor graft was harvested from a 21-year-old male with an endothelial cell count of 3603 cells/mm2. A combination of interrupted sutures and a 16-bite running suture were used to secure the graft. After completion of the procedure, subconjunctival injections of gentamycin, vancomycin, and dexamethasone (Decadron) were administered. The patient also received 250mg of IV solumedrol. The surgery was without complications. Figure 4: Pentacam scan of anterior segment OD with densitometry. 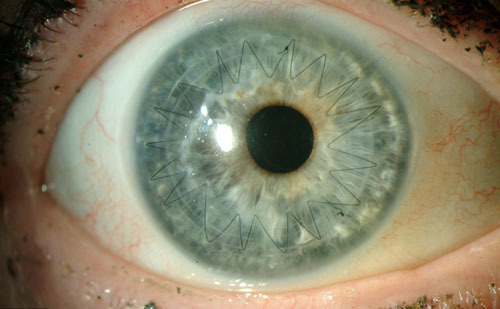 Note the presence of hyperdensity at the corneal surface (arrows). This corresponds to bullous keratopathy. 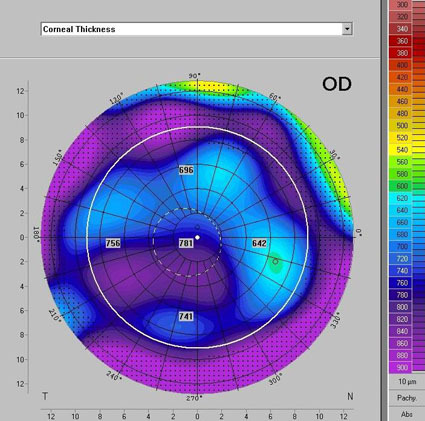 Figure 5: Pre-op pachymetry of diseased cornea. Table 1: Corneal top hat parameters of host and donor corneas. A 15kHz femtosecond laser (IntraLase, Irvine, California) cuts the recipient cornea. Note the presence of an applanation fixed by a suction ring. Based on pachymetry measurements, the laser was programmed to the desired depth. Short pulses (on the order of femtoseconds, 10-15 sec.) are delivered to the cornea, creating a circular cut. The laser pulses are then focused to a shallower depth in order to create the desired corneal shape. The remainder of the procedure is essentially standard keratoplasty technique. On post-operative day number one, the graft remained clear. Visual acuity OD was 20/160 with IOP of 14mmHg. The patient was started on preservative free tears and gatifloxacin ophthalmic (Zymar) OD six times per day. She was followed in cornea clinic every four to six weeks for the first six months. The graft continued to remain clear and there was no intraocular inflammation. Three months after the procedure, the interrupted suture at the 1:30 position was removed. Selective suture removal continued over the next several visits. At three months post-op, the patient's visual correction was +6.00+3.00 X 178 = 20/50 @ 3 months post-op. At 6 months, the graft endothelial cell count was 3155 cells/mm2 (Figure 7). At the patient's last follow-up appointment 18 months post-operatively, the graft remained clear and BCVA was 20/20 OD with a manifest refraction of +5.25+1.75x92. Pachymetry was stable with central thickness of 457µm. The patient was extremely happy with her surgical outcome. Figure 7: Post-operative specular microscopy of corneal endothelium. Endothelial cell density = 3155cells/mm2. When to consider laser assisted keratoplasty? Krachmer JH, Mannis MJ, Holland EF, eds. Cornea. 2nd ed. Philadelphia: Elsevier Mosby; 2005. 938-948. Ehlers JP, Shah CP, eds. The Wills Eye Manual. 5th ed. Philadelphia: Lippincott Williams & Wilkins; 2008. 94-95. Slade SG. Applications for the femtosecond laser in corneal surgery. Curr Opin Ophthalmol. 2007;18:338-341. Busin M. A new lamellar wound configuration for penetrating keratoplasty surgery. Arch Opthalmol. 2003;121:260-265. Bahar I, Kaiserman I, Srinivasan S, et al. Manual top hat wound configuration for penetrating keratoplasty. Cornea. 2008;27 521-526. Price Jr. FW, Price MO. Femtosecond laser shaped penetrating keratoplasty: one-year results utilizing a top-hat configuration. Am J Ophthalmol. 2008;145:210-214. Bahar I, Kaiserman I, McAllum P, et al. Femtosecond laser-assisted penetrating keratoplasty: stability evaluation of different wound configurations. Cornea. 2008;27:209-211. Buratto L, Bohm E. The use of the femtosecond laser in penetrating keratoplasty. Am J Ophthalmol. 2007;143:737-742. Ignacio TS, Nguyen TB, Chuck RS, et al. Top hat wound configuration for penetrating keratoplasty using the femtosecond laswer: a laboratory model. Cornea. 2006;25:336-340. Kezirian GM, Stonecipher KG. Comparison of the IntraLase femtosecond laser and mechanical keratomes for laser in situ keratomileusis. J Cataract Refract Surg. 2004; 30:804-811. What is "Laser Assisted Keratoplasty"? First introduced in 2006, laser assisted keratoplasty is a modification on traditional full-thickness penetrating keratoplasty. Corneal cuts are made using a femtosecond laser, which allows the surgeon to make cuts at a variety of depths. A variety of corneal shapes can be made, providing advantages over the standard transplant shape (see Key Point Text Box).